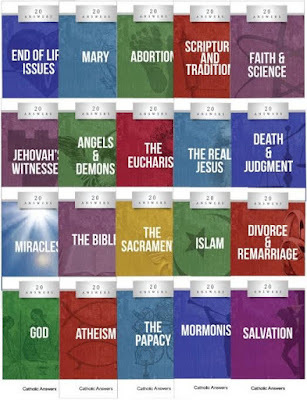 Trent Horn has written 9 of the 20 books in the Catholic Answers series. To date I have read 6 of the books he has written in the series and have read 17 of the 20 in the whole series. I am now almost finished the 20 Answers challenge. The goal was to read all 20 books in the 20 Answers series from Catholic Answers during Lent. Currently during lent 2017 you can get all 20 books for 50% off, an amazing deal, and you still have time to get them! Trent writes in a very engaging way, his arguments are clearly laid out. But as he states in this book, many people today do not like to think about the fact that we will all die; and as we as Catholics believe then face a judgement. How do we know there is an afterlife? What is the particular judgment? Are souls aware of anything after death? What are some common objections to the doctrine of purgatory? How do I stay out of purgatory? Are the souls in the next life aware of what is happening to people in this life? Should we pray to saints in heaven? What does the Catholic Church teach about the end times? What do other Christians believe about the end times? What is the general judgment? Is the doctrine of hell unjust? Is it possible that no one will go to hell? What will happen to those who never heard of Jesus? Will there be a new earth and a new heaven? This book is a challenging read. There are many who will read it and not want to believe it. It follows the teachings of the Catholic Church. But it is very well written and really should be read by all Catholics so they can answer some of the common objections to Catholic teachings. Having now read 17 of the 20 books in this series, I can say there starts to be a bit of overlap. Some very similar questions get answered a few times; but usually by different authors and from different angles. But overall the series and this book specifically are excellent. Of the 17 books in the series I have read 15 have got a 5/5 star rating and the other two both got 4 stars. So even with this being one of the more difficult topics it is well worth the time to give it a read. This is a great book in a great series, I highly recommend both.